Roses and Rot is in fact about relationships though the fae do have an important role to play in this story. Through flashbacks we learn about Imogen and Marin's childhood with their physically and emotionally abusive mother. How she actively drove a wedge between Imogen and Marin, attempting to play them off against each other. How Imogen and Marin's mother preyed upon their fears of not being good enough, always there to suggest that they were getting fat, or not grateful for the supposed sacrifices she made on their behalf. In the present, even as the sisters worked on their art, their mother continued to send them missives about their worthlessness, triggering painful memories that the two sisters simply couldn't outrun no matter how fast they danced or wrote. Imogen and Marin's roommates at Melete, are Helen the poet, and Ariel the singer. Howard could easily have made both Ariel and Helen into simple side characters to fill the page but their stories are just as rich as Imogen's and Marin's. Helen knows only too well what it is to have grown up emotionally abused and neglected by her parents. Helen paid the cost of her mother's obsession with her father and her father's indifference and desire to live a life free of encumbrances. Helen knew that her poetry was technically competent but doubted if it was actually good. At the end of the day, Helen had been so influenced that though she knew that she was competent, she didn't know who she was outside of her attempt to be a poet and her life at Melete. Yes, there was a lot of parental abuse in this book. Children got their hands purposefully burned and their hair cut off. It was graphic and painful to read; however, at no time did it ever feel gratuitous because it existed to inform the reader about who these characters were, and why they were so driven to perfect their chosen forms of art. They all came through either as survivors, or as having the ability to express agency for the first time in their lives even if said agency wasn't necessarily life affirming. In the end, from these examples we learned the absolute priority of self care and that it's okay to say good bye in order prioritize mental health and safety. I think that this is an extremely important message and it was absolutely primary to the moral of Howard's fairy tale. This is normally the part where I write that there are no GLBT characters but I am happy to say that this was not the case for Roses and Rot. Imogen and Marin's roommate Ariel was bisexual and in a relationship with a woman. Since residents were not allowed to bring family with them, Ariel traveled home on the holiday to see her girlfriend and family. Unlike so many of her fellow residents, Ariel wasn't even willing for a moment to consider giving up seven years of her life to achieve the success she dreamed of, especially if it meant leaving the woman she loved behind without even the ability to tell her why. Ariel was strong, sure of herself, passionate and warm. I've said so many wonderful things about this book that it breaks my heart to now have to turn negative. There were absolutely no characters of colour of note in this story. Sure, they showed up in the background from time to time but they were never realised. This was particularly hurtful because so much time was spent talking about art and its value to society. To just erase POC is to ignore our various contributions in all artistic spheres. Hell, there are genres of music which wouldn't exist today were it not for Blacks. I cannot imagine why Howard felt okay creating an all White world when, the addition of POC could only have broadened her story. 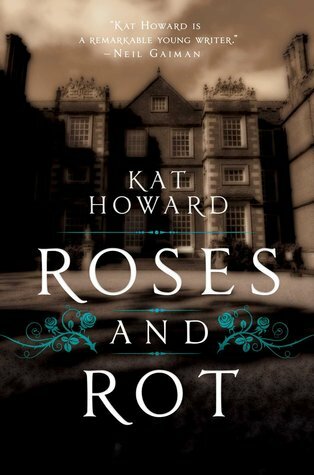 Roses and Rot is not a book to pick up unless you have a lot of time because you will quickly get sucked in and find it difficult to put down. I couldn't help but to empathise with both Imogen and Marin. Each sister was certain of the love she had for the other but like any relationships, there were unspoken hurts and truths which need to be spoken and heard - and some truths once spoken and realised can you set you free. Howard created a beautiful tapestry of words with Roses and Rot and though there were elements of fantasy, it was the relationships which drove this narrative to its beautiful and unconventional hazy ever after.